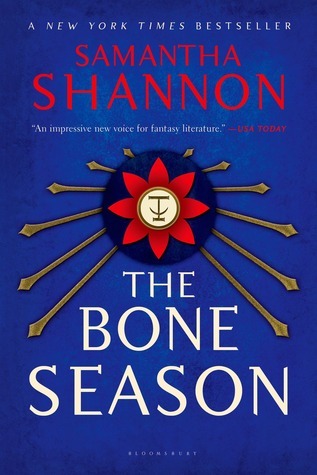 The Bone Season (The Bone Season #1) by Samantha Shannon, published in 2013 by Bloomsbury. Source: I won a signed (!!!) ARC in a pre-birthday giveaway hosted by Martin Cahill! Short: I should say first and foremost that I liked this book a lot. I think Shannon created a very complex, well-structured world and I liked the protagonist, Paige, because she’s a fighter and she’s very smart. Long: Paige, sheltered though she was as the mysterious “mollisher” (protege) of the most prestigious clairvoyant gang in London, is remarkably feisty when put into a dangerous situation on her own. I felt connected with her – I liked how she was strong enough not to fall in with the order of the detainment camp, how she struck up friendships in an unlikely place, how broken she was when she realized her love (though actually a childhood infatuation) was not returned. I liked that she had so much compassion that she saved a mortal enemy from death – three times – instead of trying to save herself. I am looking forward to getting to know her better in the sequels. I actually liked Arcturus as well, what with his gruff ways and mysterious outings, but I did have a bit of a problem with his age. Bear with me, I know I’m probably an exception in this, but every time I think of heroes who are this much older than their female counterparts (he is at least 200 years old), I cringe a little and imagine something decrepit and decaying. I have this issue with most vampire / random immortal blokes, though this doesn’t prevent me from enjoying the books! My line of reasoning is: what can a 19-year-old girl bring to a 200-year-old man that he hasn’t known before? But I guess the answer is LOVE, pure and simple, and perhaps the irrational, passionate attraction that doesn’t care for years (centuries), space dimensions or species. I thoroughly enjoyed the cast of secondary characters – from the wonderfully loveable Nick and the mysteriously nasty red-jacked David to the control-freak mime lord Jax and the tragical, brave Liss. They were well-rounded and intriguing enough that I can fully imagine following them through the series. But the thing with such a massive project (SEVEN planned books in the series!) is that Shannon had to start big with the worldbuilding. Could she have done so more subtly? Perhaps. Her world truly is incredibly complex, and even complicated, what with all these layers of souls and orders of clairvoyance and the numerous official-sounding acronyms and Victorian street slang. The resulting setting is sometimes slightly overwhelming, but never actually offputting. Shannon has written the second part, The Mime Order, already, but there are FIVE more books to go after that. So if you think about the publishing process and everything, she’s booked for at least a decade. Won’t she hate the bloody world when the ending comes around? I always ask myself this – especially with gigantic sagas like The Song of Ice and Fire by Geogre Martin. The poor guy is getting really old and there are thousands of fans waiting impatiently and nagging him daily to write the damn sequel, and I can’t help but think: If I was him, I’d send everyone to hell and start writing something else entirely. Well, Shannon is not elderly (she’s quite young, in fact), but I do hope she’ll have the energy and the will to see this thing through, because it’s very, very intriguing and I’d love to see how she evolves as a writer. All in all, I see great potential, lots of intriguing features and some slightly rough edges, so I can’t wait for The Mime Order! This entry was posted in Book Review and tagged 4.5/5, ARC, fantasy, review, series, YA on June 30, 2014 by Kaja.